Strolling through Amsterdam and getting a bit hungry? We have the perfect solution: Dutch pancakes! They can be eaten as a snack or as a main course during lunch or dinner. A Dutch pancake is good at any time of the day. Come in, relax and browse our menu with a lot of choices and variations. Dutch pancakes are traditional and worldwide famous, and there is a reason for that. They come with a topping of your choice or just plain. And it is the topping that makes the pancakes in a pancake restaurant so special. There are the traditional toppings, savoury and mouth-watering, and there are the sweet toppings, for those who have a sweet tooth. PANCAKES Amsterdam has four locations where you can enjoy the Dutch pancakes, all on top spots in Amsterdam centre, near sites tourist like to visit. So, you don’t have to go far to sit down for a top-notch quality pancake. You will find specialised pancake restaurants (we call them pannenkoekenhuizen = pancake houses) in practically any town or city in the Netherlands and Belgium. Not only for the tourists; the locals as well like to go out and eat in a pancake restaurant. In fact, many a birthday party is celebrated there, both for kids and adults. Apart from these toppings, the Dutch have other sweet toppings like cherries with ice-cream, ice-cream stand alone, strawberries (with or without cream and/or ice-cream), chocolate and sometimes honey. The savoury ones include apple, apple/bacon, banana, ham/cheese, bacon/cheese, cheese, goat cheese, camembert, smoked chicken, to name a few. Of course, every pannenkoekenhuis has its speciality or variety, or a pancake of the week/month. 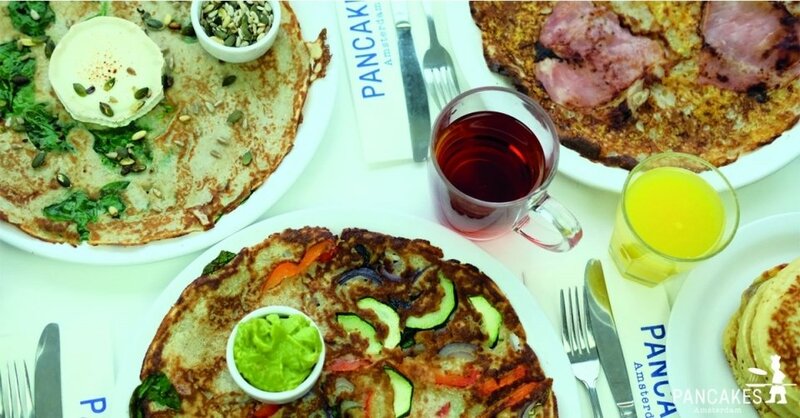 Want to see whats on the menu of PANCAKES Amsterdam, enjoy over 30 different pancakes. PANCAKES Amsterdam takes it one step further. Apart from their own creative pancakes you can create your very own pancake with the following ingredients or add one ingredient (or more) to the ones listed on the menu. What could you make with these toppings: whipped cream / strawberry jam / ice cream / raisins / chocolate sauce / maple syrup / raspberry sauce / blueberry sauce / mushroom / onion / spinach / paprika / zucchini / tomato / apple / banana / bacon / ham / Dutch cheese / camembert / goat cheese / pesto / almonds / candied ginger / crème fraiche / guacamole / smoked chicken / strawberries / smoked salmon? I am sure there is something to your liking here! Do Dutch people only eat pancakes at pancake restaurants? Nope! The Dutch eat pancakes at home as well. And the kids love to help mom or dad making them. Eating pancakes at home is also a real family thing! Just like going out to a pancakes restaurant. Making pancakes really is a ‘piece of cake’, excuse the comparison. All you need is flour, milk, eggs, a pinch of salt and the toppings you want to add. Not seldom the fruit bowl or fridge is plundered to make ‘specialties of the house’. You can take any variety of flour and replace milk by soya milk. After you have put all the ingredients together, you mix them all and beat them into a nice, liquid batter. Then the fun can start! You fry a ladle of the mixture in a frying pan with butter or oil in it. Flip the pancake after the edges start browning. If you are an expert, you flip the pancake without any utensil to assist you. You can choose to make a stack of pancakes and then start eating them or take turns at the stove. Be prepared; the first hoem made Dutch pancake is always a misfit but tastes good anyway. Probably the frying pan is not in the mood yet to do the job. Just like pancake restaurants have an informal and cosy character, eating pancakes at home is also an informal matter. And cosy, very cosy. Don’t be surprised when the youngest kid ate just one too many… kids tend to do that and yet live through the night, fortunately. Want to enjoy Dutch pancakes? We invite you to have an excellent pancake breakfast, lunch or diner at one of our 4 locations, all three situated in the centre of Amsterdam. For groups we advise you to make a reservation, so you definitely have a nice place.